Written by Brittney Gilleland . Media by Kelsey Neier. 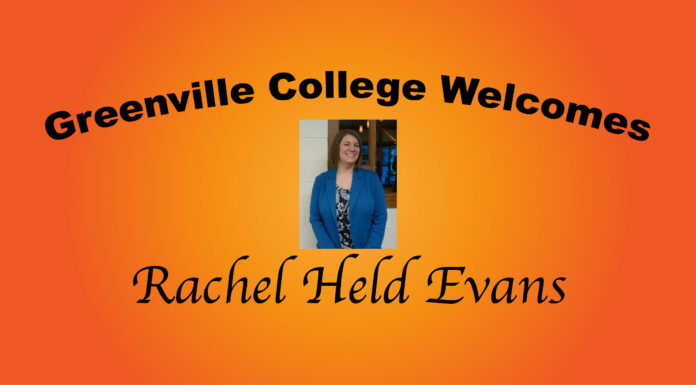 Last Thursday and Friday, Greenville College was honored to welcome Rachel Held Evans to campus, writer of Evolving in Monkey Town and A Year of Biblical Womanhood. Her visit began with a coffeehouse hangout at Jo’s Java, where students, faculty, and community members were encouraged to come and hang out and ask questions that they had for Rachel. 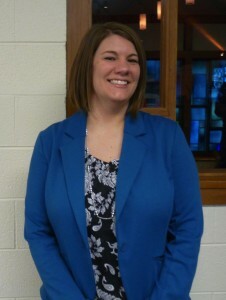 Rachel Held Evans. Media by Kelsey Neier. Following the coffeehouse, she spoke in Vespers about doubt, questioning, and faith. It was during this talk that students got their first glimpse of what Rachel is all about. She walked us through her life, and the season of questioning that she went through, and gave us comfort in knowing that questioning is okay, and ultimately is healthy for our theology. The floor was opened up for questions after her talk, and students began to engage in dialogue about doubt and questioning. Many students expressed their thanks for Rachel for being so honest and real, as that spot of questioning was where they are dwelling. Rachel made herself available after Vespers to meet her audience, and continue the conversation of what it means to question. Many students, alumni, faculty, and community members took advantage of this opportunity. Well into the night, Rachel continued to give hope to so many people, answering their questions, signing books, taking pictures, and engaging in conversation. Her visit to Greenville ended with her chapel speech on her book, A Year of Biblical Womanhood. The book describes her experiences of taking every instruction that the Bible has about women as literally as she could. She walked us through her journey, allowing us to enter into it with her. She showed pictures and told stories about her experience. Growing her hair out for a year, remaining silent in church, covering her head as she prayed, and even referring to her husband as master, were just a few of the things that she did during her quest for Biblical womanhood. She ended her speech by breaking the mold on Proverbs 31. While most of us view Proverbs 31 as a checklist to the perfect woman and wife, Rachel encouraged us to take a look at a different perspective. During her year of Biblical womanhood, she met Ahava, and she taught Rachel what Jewish women read when they read Proverbs 31. It’s not a checklist, it’s not where the bar is set for women, it’s a celebration of who women are. Ahava told Rachel that both men and women memorize Proverbs 31, and men sing it to their wives as a celebration of who they are. Rachel has set a new standard for the women on this campus. May we all see ourselves as Women of Valor, Eshet chayil. Rachel came to campus for a long awaited visit. During her time here, she allowed so many people to speak into the area where they have remained silent and gave so much hope to those who were in need of it. As we move forward from here, may the words of truth that Rachel spoke ring in our ears, as we move forward in our spiritual walk with Christ.